Any one who has driven a Jeep knows that they can be a hand full. This is especially true if you don’t have any weight in the back, the roads are slick, and you have 32 inch tires that are more designed for snow then road use. With all of this in mind, I decided to make my rear bumper first. The three things I needed from this bumper are: weight, strength, and a storage bin. The basic design was simple, so I didn’t start out with plan. I started by building the frame. I made the frame out of 2″X2″X 0.25″ angle iron. I was going to only create a frame for the top of the bumper, but decided that it would be easier to also make the bottom half of the frame. 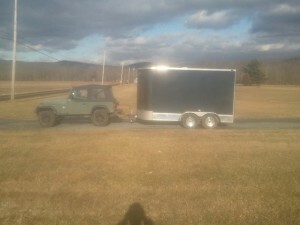 To reinforce the structure, I put 4″X2″X0.25″ U channel behind both D ring locations, and on top of the trailer hitch. Next I began to build the mount that I will use to attach the bumper to the Jeep. I ran a piece of angle iron across the top of the of the jeep frame. The back portion of the Jeep frame looks like a half dog bone. The two ears are where the side rails attach to the back portion of the frame. So I wrapped the angle iron around this ear. Sorry if this is hard to imagine. Unfortunately, I failed to take a picture of the mount. Just trust me when I say it is strong. Once the mount was welded to the bumper, I started to wrap the bumper frame with 1/8 inch plate steel. As you can see above, I cut holes into the plate steel. 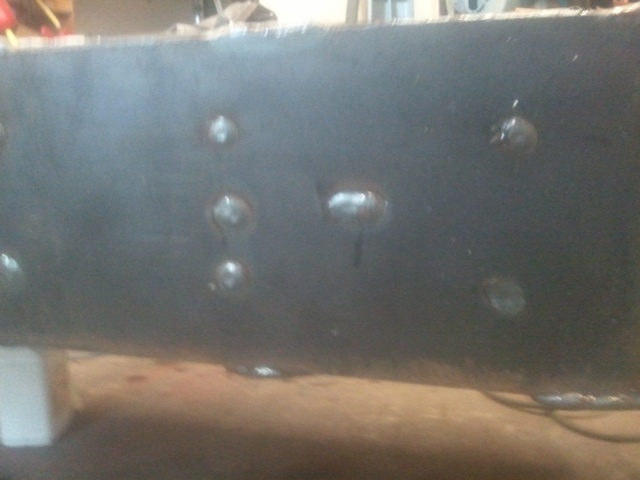 I then filled these holes in with the welder. The idea is to prevent the plate steel from tearing off since the D rings will be welded to it. It also gives the bumper rigidly since there are more weld points between the frame and the skin. 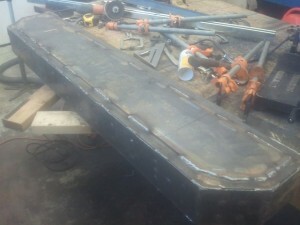 The picture below is the underside of the bumper. The plate steel was only eight inches wide, but the bumper was ten. That is why there is a one inch space around the bottom plate. 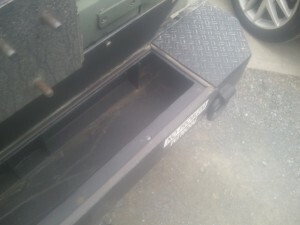 To secure the bumper to the frame, I welded a .25″ plate inside the end of the Jeep frame. 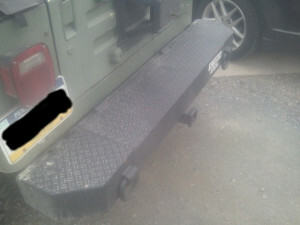 The bumper is bolted to these plates using a 3/4″ bolt per side. However, during install, the bumper held on the frame by the mount alone. I was even able to sit on the bumper without a single bolt. For the top, I used diamond plate. The door is held down by neodymium magnets. Shockingly, they haven’t shattered yet. I glued the magnets on with JBweld after everything was painted. I did it this way mainly because I forgot to glue them on before the paint. The door will be locked via my tire holder that I still need to make. Hopefully, when I build that I will have more pictures. 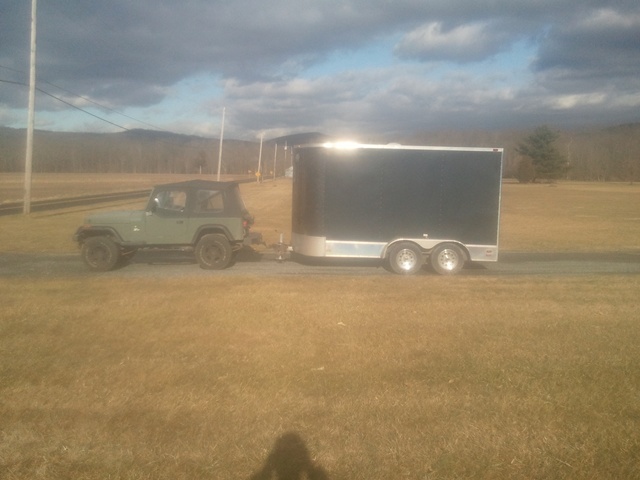 In the end, I have a somewhat large bumper, and a rather nice storage bin. I am willing to bet that the bumper will be able to be used as a mounting point if I ever need to air lift my jeep. Because, hey, you never know when you are ever going to need to do that. 🙂 After most of the bumper was built, I decided to weight it. It came in at 160 lbs. I think that might just be heavy enough.